Last week I saw Eduardo de Filippo’s play The Syndicate, currently touring UK towns and cities. 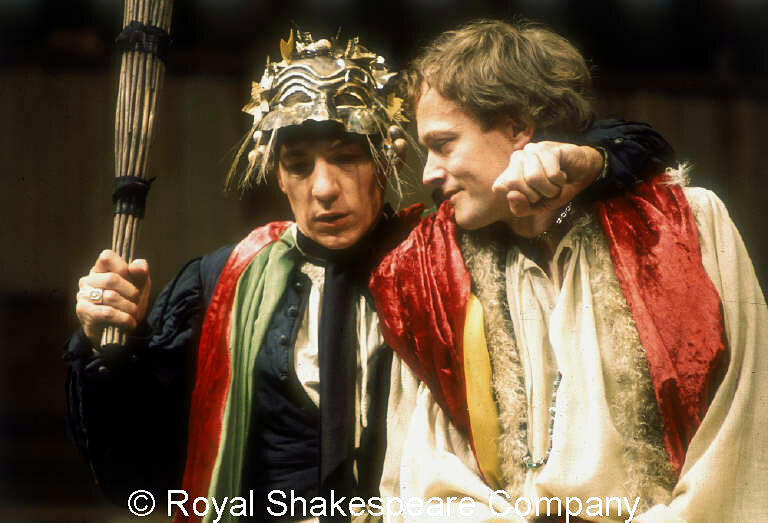 It stars two great Shakespearean actors, Ian McKellen and Michael Pennington. Watching them in this subtle play it occurred to me that the last time I’d seen them together onstage was in 1977 in Romeo and Juliet at the Aldwych, where they’d played Romeo and Mercutio respectively. It was a heady time for the RSC. What I loved was the sense of company: Romeo and Juliet set in Renaissance Italy one night, a musical version of The Comedy of Errors in a Greek tourist resort the next, many of the same actors in both, performing with terrific panache. Both men have since had outstanding careers in Shakespeare and other drama. They’ve both also performed one-man shows about Shakespeare, Acting Shakespeare by McKellen and Sweet William by Pennington. 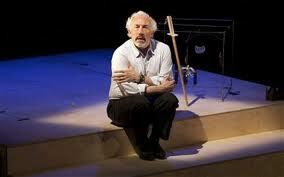 This year I’ve also seen Simon Callow in his show Being Shakespeare and Roger Rees in What you Will. Incidentally Roger Rees played Benvolio in that same production of Romeo and Juliet. The idea for Gielgud to put on his own Shakespeare performance came from his great-aunt, Ellen Terry, easily the most famous actress of the late nineteenth century. 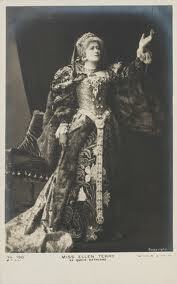 When she became too old to play them onstage, she performed extracts from her famous roles in Shakespeare’s Heroines. Just recently Judi Dench was interviewed on BBC Radio 4’s arts programme Front Row. One of Mark Lawson’s questions was about solo shows, and her answer was very revealing about her approach to working onstage. I wouldn’t do a one-woman show. It would be death for me. I would not know who to get ready for. I suppose it’s the support, and what appeals to me is the fact there’s a group of people…so there’s author, director, cast, audience and it’s something to do with that process of telling that story that I love… but I don’t want to do it on my own. I suspect that love of collaborative working in the theatre is something that Shakespeare would recognise. He wrote for a group of people he knew, and he would have imagined as he wrote how they would speak the lines, how they might move. He’d have heard stories of seafaring, gossip and odd turns of phrase in alehouses and in the streets. The film Shakespeare in Love shows Shakespeare writing in private, while picking up snippets (and even play titles) from all kinds of sources, and bouncing ideas around with friends and colleagues. Why, is not this better now than groaning for love? Now art thou sociable, now art thou Romeo; now art thou what thou art, by art as well as nature. One-man plays are hugely enjoyable, giving actors the chance to show off their virtuosity, but it’s the interaction of theatre that really gives it appeal for audiences as well as professionals. 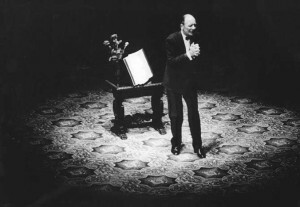 This entry was posted in Plays and Poems, Shakespeare on Stage, Shakespeare's World and tagged Acting Shakespeare, Ages of Man, Being Shakespeare, Ellen Terry, Ian McKellen, John Gielgud, Judi Dench, Michael Pennington, Roger Rees, Romeo and Juliet, Shakespeare, Shakespeare in Love, Shakespeare's Heroines, Simon Callow, Sweet William, The Syndicate, What You Will. Bookmark the permalink. As someone who toured my own one-man version of Hamlet I agree it’s rather solitary backstage but I found it enhanced rather than diminished the relationship with the audience in performance. It felt a bit like being a stand-up comic or a singer, you are in the same room as the audience, not behind an imaginary invisible fourth wall, and the lack of other people on stage meant the audience was a far more decisive factor in how the show went every night. Andrew, Thanks for this insight. A one-man Hamlet sounds challenging! When I saw David Tennant’s Benedick recently I thought how like a stand-up his performance was, and Shakespeare writes both Benedick and Hamlet in a way that encourages the actor to communicate directly with the audience. I’m not sure that any of Shakespeare’s female characters do this – perhaps that’s another reason Judi Dench doesn’t want to do her own show? After I posted that reply I remembered I meant to mention that Tim Crouch’s one-man show, ‘I, Malvolio’, is coming to Stratford soon. I’ve read the script, which is brilliant, and he got 4 star reviews in The Guardian http://www.guardian.co.uk/culture/2011/aug/24/i-malvolio-review and in The Independent http://www.independent.co.uk/arts-entertainment/theatre-dance/reviews/i-malvolio-traverse-edinburgh-2342465.html so it’s definitely one to book for. Thanks Andrew! It’s playing in Stratford 21-23 October.